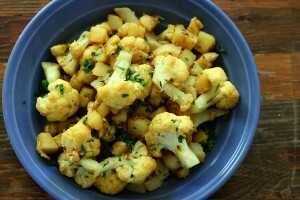 Aloo Gobi recipe by Zzz at DesiRecipes.com. In oil, fry the onions till brown. Then add the tomatoes and all the masalas. Add the ginger garlic paste.when the tomatoes are slightly cooked, add the cubed potatoes. Add some water along with it(around half a glass). Cook for around 15-20 minutes. Now add the cauliflower and cook till vegtables are tender. Garnish with green corriader leaves. Awesome!!!!!!!!!!!!!!!!!!!!!!!!!!!!!!!!!!!!!!!!!!!!!!!!!!!!!!!!!!!!!!!!!!!!!!!!!!!!!!!!!!!!!!!!!!!!!!!!!! I cooked It It Tasted Awesome! Very tasty and heathy recipe. Few calories and fills you up.